The Oscar nominations are out, which means we already saw some people get the shaft this awards season. Now it’s time to look at what we know, and what we’ll soon know, about which actors and which films have an edge in the race. Our Oscars model aims to gauge the state of the race by making sense of the myriad critic and guild awards that take place before the Academy Awards, looking at historical precedent to find out how much credibility we should actually assign to these precursors. We’ve had about two months’ worth of nominations and wins to sort through, but we still have the best four dizzying weeks to go. This weekend will be the busiest and most consequential of the entire awards season when it comes to gauging true Oscar heat — the kind that comes from actual Oscar voters (our model gives the most weight to awards from industry insiders). The winners of the prizes from the American Cinema Editors, the Producers Guild of America and the hugely consequential Screen Actors Guild will be announced. Here’s a primer on what’s already gone down and what to look forward to. Isabelle Huppert (“Elle”) has fought her way into the conversation, winning the best actress prizes among critics in Los Angeles and New York and the Golden Globe for drama. 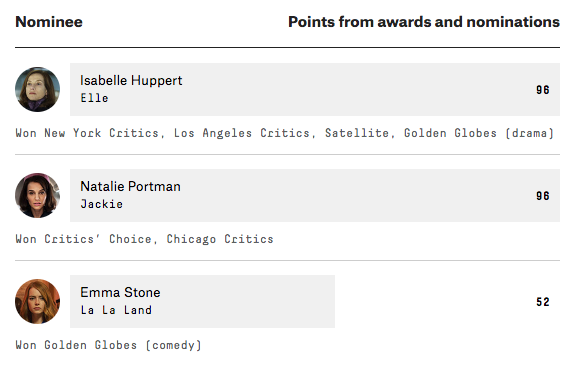 However, she’s hit her ceiling in our points-based model; she’s not nominated for the SAG or BAFTA awards, so we don’t see a way for Huppert to extend her lead. So which of her rivals can leapfrog her? Natalie Portman (“Jackie”) — who won an Oscar in 2011 for “Black Swan” — is up for both awards, and based on the points she’s racked up, winning either would make her the favorite. Other contenders include Emma Stone (“La La Land”), who won the Golden Globe for actress in a musical or comedy — an award that also makes an outstanding flyswatter and is worth like 3 points in our model. She would have to win both the SAG award and at BAFTA for a guaranteed finish to the season as the front-runner. This is an uncomplicated category: Casey Affleck (“Manchester by the Sea”) has had a fantastic run, with wins at the Golden Globes, at the Critics’ Choice awards, from the Chicago and New York critics, and from the National Board of Review. This category takes its cues from the SAG and BAFTA prizes, and all the Oscar nominees are up for the SAG award. Unless Affleck gets rejected this weekend at SAG, the Oscar is his to lose. Viola Davis (“Fences”) has won the only two important prizes in this category that have been handed out so far, the Critics’ Choice and the Golden Globe. 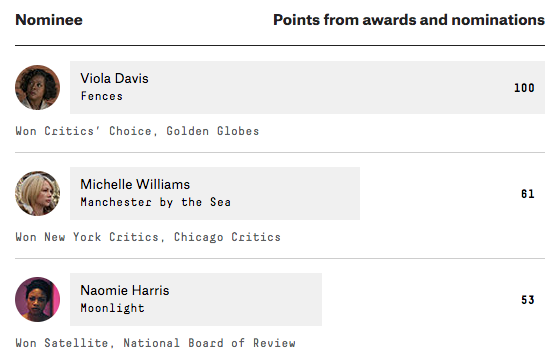 The other critics prizes don’t mean all that much here; Michelle Williams (“Manchester by the Sea”) won in New York and Chicago, and Naomie Harris (“Moonlight”) won at the National Board of Review and the Satellite Awards. All five Oscar nominees are up for the SAG award this weekend, and given the predictive power of the prize, on Sunday, we’ll have a pretty definitive look at where this race is headed. Once again, the Golden Globes have screwed us. Last year, the Hollywood Foreign Press Association members threw the award at Sylvester Stallone, who went on to lose the Oscar to Mark Rylance, and this year, they gave it to Aaron Taylor-Johnson, who isn’t even nominated for an Oscar. So what do we know? Jeff Bridges (“Hell or High Water”) locked up the Satellite and National Board of Review prizes but is a definite underdog. Mahershala Ali (“Moonlight”) won the Critics’ Choice award, as well as the top supporting actor prizes from the New York, Chicago and Los Angeles critics. He’s the strongest contender in this category. In the end, this award comes down to the winner of the SAG and BAFTA awards. Should Ali win at the Screen Actors Guild this weekend, he’s probably a shoo-in for the Oscar. There are three strong contenders this year, but “Zootopia”1 is leading the bunch. “Zootopia” pulled in wins at the Golden Globes, at the Critics’ Choice awards and from New York critics, while “Kubo and the Two Strings” won in Chicago and at the National Board of Review. Once the editors — a solid contingent of Oscar voters — rule this weekend, we’ll have a better understanding of the race. Only two of the five Oscar-nominated documentaries have racked up the points at earlier award shows: “13th” won at the Satellites, and “O.J. : Made in America”2 won with the New York and Chicago critics, at the Critics’ Choice awards, and at the National Board of Review. This weekend, the American Cinema Editors give out one of the more predictive awards in the doc category. Both “O.J.” and “13th” are nominated, and this will give us the only head-to-head for these two films before Oscar night; “13th” isn’t up for a Producers Guild award, and “O.J.” isn’t up for a BAFTA. The only award of value that’s left to be given out in this category comes Feb. 4 from the Directors Guild. 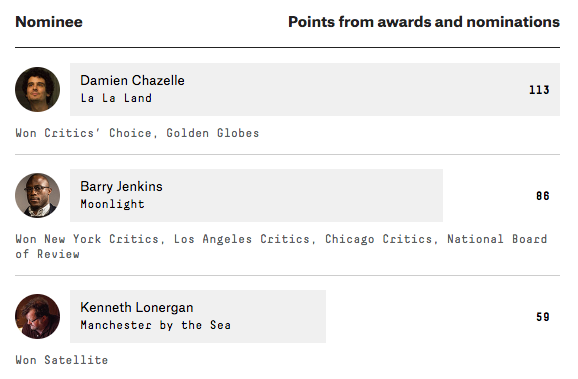 Damien Chazelle (“La La Land”) has won at both the Critics’ Choice and Golden Globes, but those wins will mean very little if Barry Jenkins (“Moonlight”) or Kenneth Lonergan (“Manchester by the Sea”) wins at the DGA. We’re looking at a three-way race between two fantastic films and also “Manchester by the Sea.” “Moonlight” won the Golden Globe for best drama and won the Chicago and L.A. critics awards. 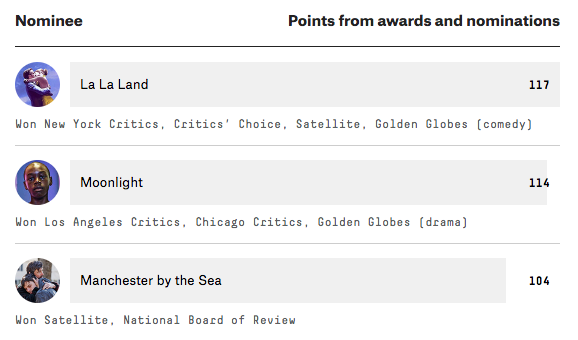 “Manchester by the Sea” won with the National Board of Review and tied with “La La Land” for the Satellite award. “La La Land” won the Critics’ Choice award, the New York critics award and the Globe for best musical or comedy. So where does that leave us? Winning the American Cinema Editors prize this weekend could help “Moonlight” or “Manchester by the Sea” stand out, but the real high-value awards in the next few days are from the Producers Guild and SAG. Any film will be ahead of the pack if its producers take home the PGA’s Darryl F. Zanuck producer of the year award — a prize so helpful the PGA boasts about its predictive power when it comes to the Oscars — and its performers win the Screen Actors Guild’s “outstanding performance by a cast” award. If the movies split those prizes, we’ll need the Directors Guild and BAFTAs to sort us out — or else we’ll be well and truly boned. This is a Disney movie, and Disney owns ESPN, which owns FiveThirtyEight. This film is from FiveThirtyEight owners ESPN.